November's Mama of the Month is the one and only Karri Paxson. If you have taken a class with Karri, she is the one that probably gave you a warm smile at any point during the workout. Karri married her husband, Doug, about 5 years ago, and has Morgan (3) and Braydon (1). We are pretty much obsessed with Karri's enthusiasm for a community of moms. She even organized getting a group of mamas from her Body Back class to run the Hot Cider 5K together! We love Karri's "let's make it happen" attitude. Karri started with FIT4MOM in Fit4Baby when she was pregnant with Braydon, and since then has rocked stroller strides and is about to complete her second session of Body Back. Karri works full time in HR downtown. Karri's other loves include coffee, Bravo, wine, planners, and spending time with family and friends. Cheers to you Karri, and your friendly smile. Thank you for always making everyone you encounter feel like you are happy to be around them. Our Village is a warmer, stronger community because you are part of it. We love you Karri! 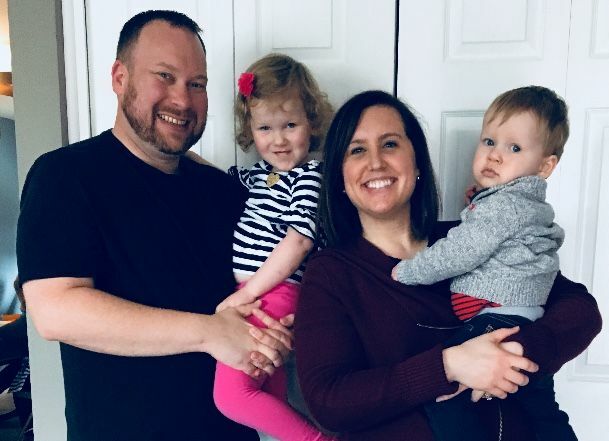 Tell us about who is in your family: My husband, Doug, and I have been married for 4 years and we have two great kiddos, Morgan (3) and Brayden (1). Current/Previous career: I’m currently an HR Manager for a communications company. What was your childhood ambition? : I had many childhood ambitions, but the one that stands out is that I wanted to be a news anchor. There’s a video somewhere of a 5 year old Karri pretending to be a news anchor. When I’ve shown it to people it brings tears to their eyes – not from my talents, but instead from all of the laughing, ha! What does motherhood mean to you? To me, motherhood means strength. Motherhood has been the absolute best thing that has ever happened to me, but also the hardest thing I’ve ever done. I think as mothers we find strength we never knew we had – especially when we are raising little humans on no sleep. All mamas are stronger than they realize! What is the furthest you have been away from home? Australia. My husband and I went to Australia for our honeymoon and it was the best trip I’ve ever taken. When we went I thought it would be a once in a lifetime trip, but after a few days I knew we had to go back. Hopefully when our kids are older we can return. How did you find FIT4MOM? When I was pregnant with my son I was looking for a pre-natal fitness class and found Fit 4 Baby through the park district. During that class the instructor told us about Stroller Strides and I ended up getting the maternity leave pass. I really enjoyed Stroller Strides and decided to jump into Body Back, which I have loved! How as FIT4MOM changed your life? FIT4MOM, specifically Body Back, has helped me to focus on my priorities, including a healthy lifestyle for my family and me. Favorite exercise: Tabata is my favorite! You can do anything for 20 seconds. Proudest moment: My proudest moments were when my kids were born. Tell us something about yourself that would surprise us: Since graduating from college I’ve moved a few times – I’ve lived in 3 major cities and have moved 7 times. We’ve been in our house for 3.5 years, which has been my longest residence since my childhood home. However, we’re planning to stay where we are so hopefully no more moving boxes. Looking for some fun moms only classes? Join us this holiday season for our Body Back mini session. Early bird pricing ends 11/4!